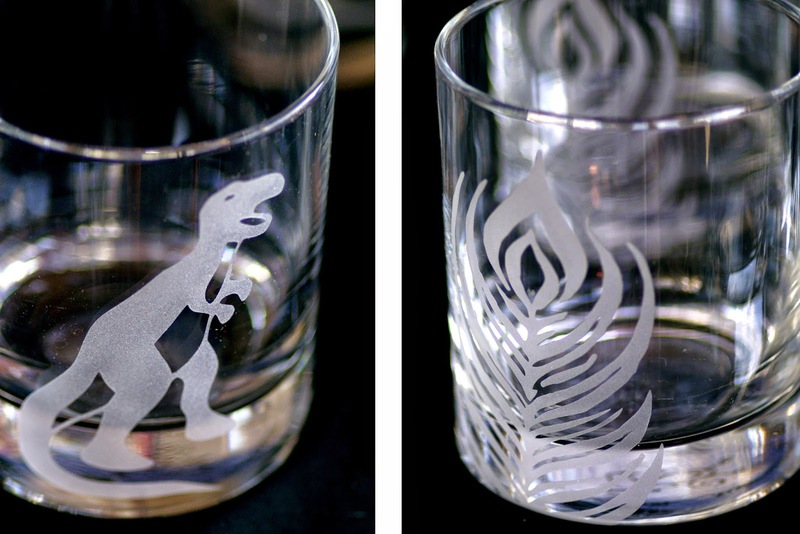 Hand Sandblasted Designs on Fun & Functional Drinkware. Creativity & Flair to Dress Up any Drink, from Water to Wine. The first three letters in "Functional" spell "Fun," and that's exactly what multi talented Austin Artist Amy Davis adds to practical objects, elevating them to display worthy creations you'll love to use. While she has dabbled in many artistic techniques ranging from pottery to painting to stained glass, her current focus is etching. 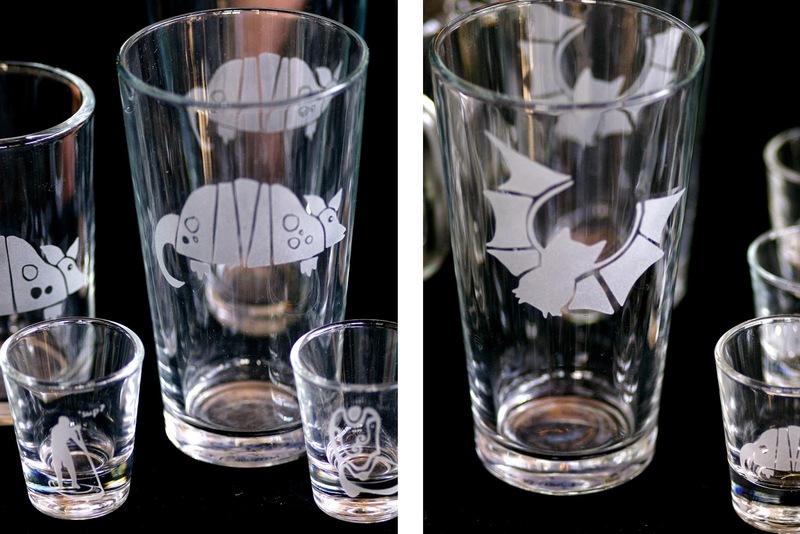 She most commonly works with drinkware adding custom drawn designs. The stencils she uses start as sketches that she then digitizes to create a cutout. 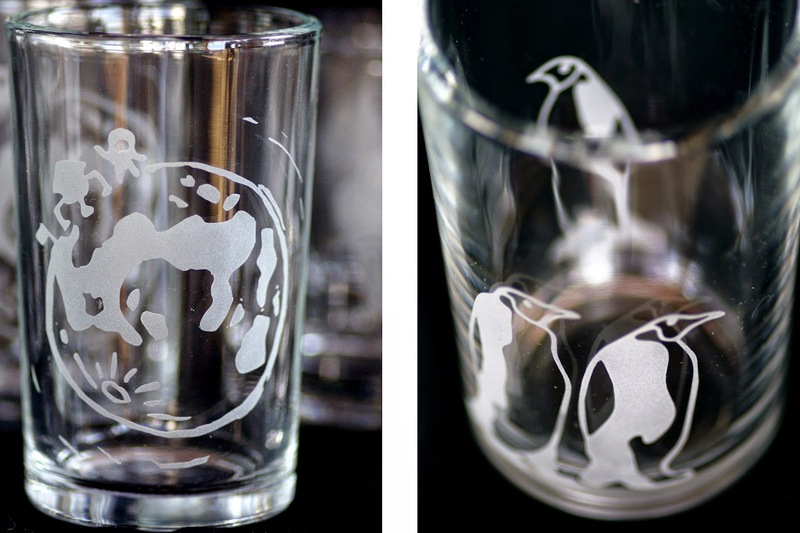 Each glass, available in varying sizes, is handled with care and emblazoned with the design by hand, with the help of a sandblaster. This method yields even, long lasting results so the pattern looks great with every use. 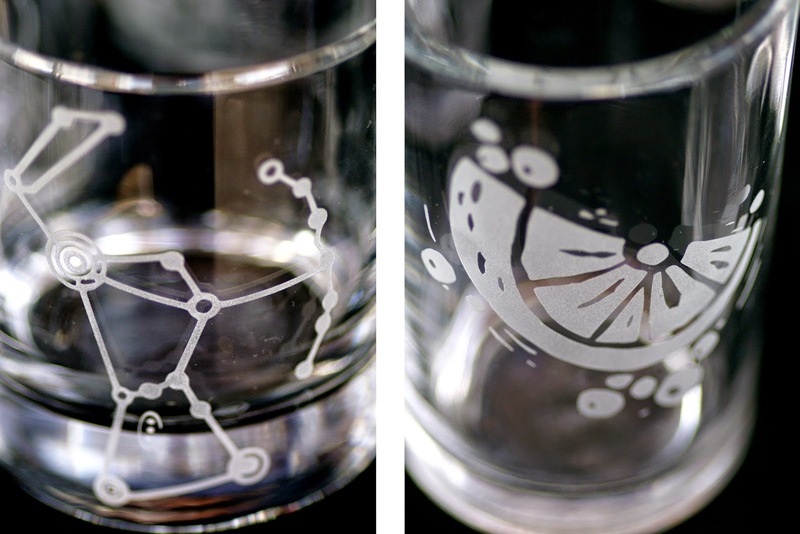 Depending on your style, you can get a set of matching glasses or mix and match within the same theme. Amy has a number of unique designs to choose from: Dinosaurs, Astrological Signs, Nods to Geek Culture, and my personal favorites, Austin Icons, among quite a few others. Who wouldn't love to drink juice with penguins at breakfast or celebrate a happy occasion with cowboy boots, on the glasses I mean. This artist's inspiration comes from all aspects of life, but she also welcomes custom requests. You can be sure, whether you opt for shot, juice, water or wine glasses, you will be getting all originals that will make you smile with every sip!